A new photographic exhibition at PSU explores trans and queer identities in the context of mass incarceration, through the art of absence. 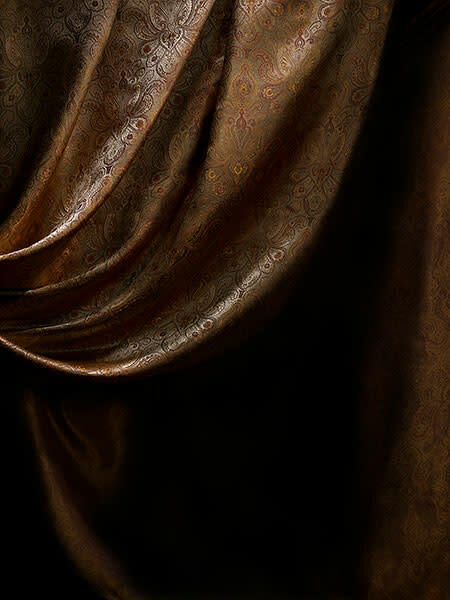 Photograph of fabric from Policing Gender, evoking renaissance and baroque portraiture. Sometimes less is more. That’s the idea behind Portland-based Lorenzo Triburgo’s Policing Gender art exhibit, which meshes portraiture, aerial photography, and recorded conversations to tackle the absence of incarcerated LGBTQ community members. The installation debuted on Wednesday at Portland State University’s Littman + White gallery. The installation, which received a project grant from the Regional Arts & Culture Council, is a departure from Triburgo’s previous work, Transportraits—a five-year project that depicted transgender individuals in striking portraiture. 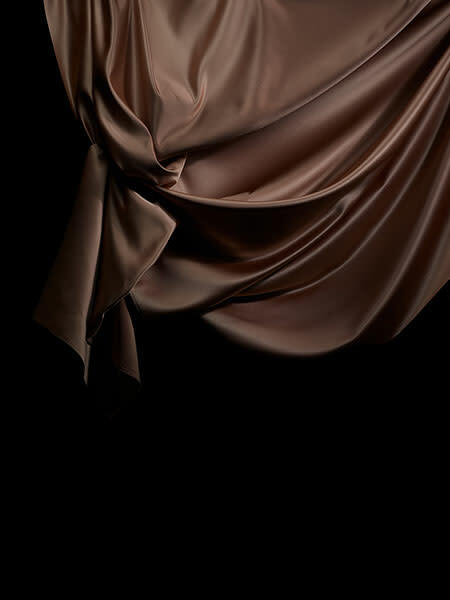 Much the opposite, Policing Gender presents the viewer with dark, draped fabric backgrounds befitting a portrait, sans subjects. 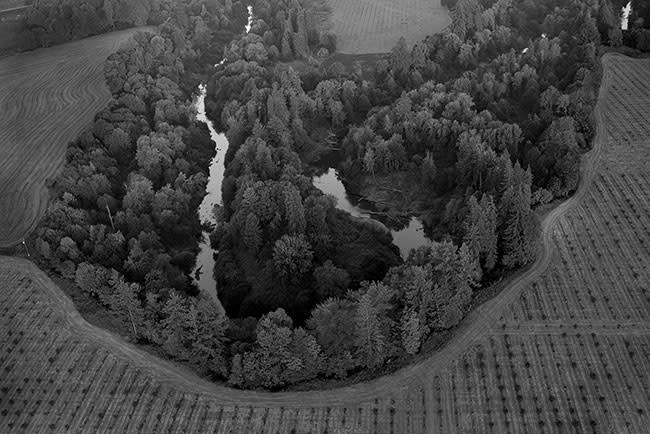 Smaller black and white aerial photographs of obstructed natural landscapes support the grand, brooding non-portraits. A fifteen minute ambient recording of queer and transgender inmates recounting their life experiences echoes on loop throughout the stark white hallway gallery. The cumulative effect—portraits without people, perspectives of power, voices without bodies—depicts a negative presence, the denial of human form in a natural photographic framing device. But Policing Gender is also free of visual tropes common in prison photography. A black and white aerial photo from Policing Gender. According to the artist's statement, these photographs "refer to flight, freedom, surveillance, and restraint." “I didn’t want to add to the plethora of images of people behind bars, people being thought of and treated like animals,” says Triburgo. “I decided to use audio, instead of trying to use my lens to represent someone else’s experience.” Currently, the audio element of the exhibit consists of 15 inmates’ recollections, with plans to incorporate more over time. The project got its start when Triburgo began corresponding with inmates from various prisons across Oregon. At the same time, he began researching life in American prisons through books like The New Jim Crow, Captive Genders, and Are Prisons Obsolete? Much of what Triburgo read lined up with the issues articulated by queer and transgender inmates: poor legal representation, lack of access to proper medical treatments, being disowned by family, and more. “It was really hard for me not to feel like I needed to dedicate my life and time to this,” says Triburgo, who will be hosting a workshop in conjunction with Policing Gender at PSU. The workshop will be held on Nov 18 in Smith Memorial Student Union, and will explore the present state of prison reform activism. Attendees will also be encouraged to write Christmas cards for inmates, many of whom have infrequent or no communication with the outside world.